Lambert Zuidervaart, with enormous care and admirable clarity, as well as with immense scope, devotes himself to the critical retrieval of the reformational philosophy tradition. Herman Dooyeweerd could hardly have imagined an at once loyal as well as creatively critical interpreter and transformer in the English speaking world such as has been emerging in Zuidervaart’s voluminous output. I am honoured on this occasion to join in a discussion of his forthcoming book of essays exploring themes in reformational thought. One of the issues Zuidervaart tackles in his retrieval project is the reformation of reason. As an example of why and how he selects and develops this project he explores, for good reasons, my work on reason, which was prominent in my career and leaves a good deal to be desired. As I now reflect on that work, two things stand out. 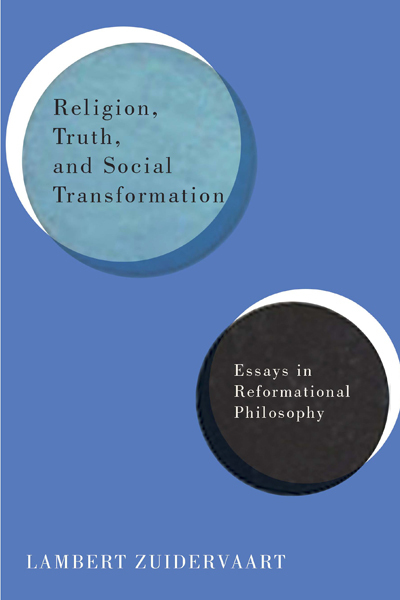 One is that I relied too much on the transparency of the reformational tradition’s work on modal analysis as that affects matters of rationality, faith, religion, and spirituality, without carefully explaining, as Zuidervaart now does, the intricate and complicated conceptual moves of the tradition. The other is that, perhaps more than anyone in the tradition and despite being aware of the problems Zuidervaart points out, I assumed a direct and obvious connection between rationality and order. In this blog I will continue to work with the tradition’s modal analysis, but I have moved well beyond my earlier views about rationality and order. Zuidervaart likely also has moved beyond some of his positions in the chapter to which I respond. I hope, however, that some of the issues I discuss are still worth exploring. Zuidervaart rejects the assumption in the Western rationality tradition, in reformational thought, and in my work that reason is about order. He is especially critical of what he takes to be an unavoidable consequence of such a view of reason, namely that it comes with a realism about order as a mind independent and given realm of atemporal immutables. Although I acknowledge that this has been the position of the Western tradition on reason for centuries, including reformational thought, I am less sanguine about the inevitability of this conceptualization of order as what reason is about in the tradition. Does Zuidervaart see the Western tradition’s order disappear when philosophers positively evaluate time, history, and culture? Will they reject order as no longer helpful in a more dynamic world? When he suggests or implies that realism does not accompany reason when it is about validity, does he overlook that what in the tradition has often gone by the name of order has been named in a great variety of other ways, including validity? The realistic realm of immutables has, besides being called order, also been called law, idea, universal, limit, boundary, norm, rule, condition, validity, system, definition, concept, name, determination, standard, essence, form, principle, structure, regularity, pattern, nature and probably more. In the realistic reformational tradition Vollenhoven referred to the nature of order (the being of the law, in his words) as validity, without thereby compromising his realism. So the question I raise here is: why would it be safe to assume that there can be no realism of validity or why could order not survive as a contested, temporal, cultural discovery? So the question I raise here is: why would it be safe to assume that there can be no realism of validity or why could order not survive as a contested, temporal, cultural discovery? Perhaps my question here uncovers a problem in dealing with reason or rationality in terms of what it is about. If we were to approach rationality as one functional way of relating to all that is real, would what it is about necessarily focus on one kind of reality, as distinct from other reality? Would order or validity come into view as all that rationality is about? If we are, as I am, sympathetic to Sellars’s view of rationality as normed behaviour in the logical space of reasons, would only temporized order or validity come into view in that space as all that rationality is about? Could this line of questioning lead to a different reformation of reason than one that focuses on what reason is about? What was it in the Greeks’ Nous that seemed so promising to the earliest philosophers? Arguably theirs was a historical, cultural response to their way of being in the world, which seemed to them a treacherous home of changing appearances. Nous on the other hand provided access to an immutable divine sameness. Following the path of Reason thus offered an escape from treacherous appearances and gave access to permanent stability. With all manner of variation this remained, in my view, the heart of the rationality tradition. And in the Reformational Tradition, with various adjustments, the divine sameness revealed to Parmenides’s reason was interpreted as God’s order of creation. Am I far off base to ask whether in Zuidervaart’s proposals concerning reason, the path of reason retains its privilege? Is validity specifically correlated to rationality and vice versa? I acknowledge that the logical space of reasons is not only itself normed but properly helps us, among other benefits, shape a world of norms and their validity. Does Zuidervaart have a stronger view of reason in which validity is primarily in a monogamous relation with reason? If so, has his proposed reformation of reason actually dealt with reason itself, in addition to what reason is about in his view? I am more hesitant, however, when I evaluate these claims in light of how Zuidervaart reads my views based on modal analysis. He seems troubled that in certain contexts my analysis “privileges faith over reason.” I have no problem with such privileging being inappropriate in a given context. But I also consider that in practices of faith, faith qualifies these practices, where qualification permeates the character of the practices as a whole. And I do not consider qualification as a form of privileging. So what do I make of the rationality of faith as “certain practices in which validity claims are raised, contested, revised, and borne out.”? I am inclined to at least ask: How does this rationality differ from that of the rationality tradition, not in what it is about but in what is considered legitimate in its practices? Do practices of faith derive their legitimacy from reason? Zuidervaart sounds skeptical when he interprets my honouring of faith as sometimes a qualifying function in certain practices. He suggests that on my view “the practices of faith always already trump any rational critique that could be offered them.” Might Zuidervaart’s view give reason the role of legitimation in practices of faith? Might Zuidervaart’s view give reason the role of legitimation in practices of faith? In making a claim of faith, rational criticism can certainly help unpack such a claim. It’s healthy to think seriously about the scope of the confession “Jesus is Lord.” But for the person taking a stand in that confession its reliability is a given so long as the person takes that stand. The best example I can give of how faith functions de facto is what happens to churches when history moves beyond choices they have made. If these choices—only men can be ordained, marriage is for one man and one woman only—are considered to be inextricably interwoven with articulated interpretations of faith, the church will not move. And when movement finally comes it will virtually never come as a result of rational criticism. At the deepest level a confessional claim like “Jesus is Lord” does not become rationally contested or revised as to its origin in the embrace of a mystery. Taking that stand did not happen as the legitimate outcome of engaging in certain rational practices, not even in the contemporary world, nor will the confessor be open to a rational evaluation of its legitimacy. On the other hand, rational critique of a theological doctrine, a rational challenge of its legitimacy even, is fitting in the context of reason’s role in theology. But whatever the faithful are confessionally committed to in their life of faith will be held as non-negotiable. The public recognition of this in modern democracies appropriately leaves room for churches to live “outside” the law. Legislation prohibiting homophobic practices exempts churches. In our time, in politics as well as science, the legitimate role of faith is more and more widely acknowledged. The neutrality of the public sphere is no longer an unquestioned assumption. And rational justification has limits even in science. Thomas Kuhn convincingly argued in the seventies of the previous century that the relation of scientists to a theory-guiding paradigm is one of commitment rather than rational justification. In Kuhn’s view moving on to another paradigm is not so much the result of rational criticism, empirical evidence, or persuasive argument as it is the outcome of a conversion. [I]n my view the Bible’s references to “Trinity” have a ritual liturgical origin that does not lend itself to being considered as a gateway to onto-theology. As Zuidervaart acknowledges, in this area lie his and my deepest differences. And they are not limited to his critique of the contextualization of rationality by faith in fiduciary practices. He also suggests the appropriateness of rational access in philosophy to “the Trinitarian complexity of God’s relationships to creation….” In the classic rationality tradition this would be entirely acceptable. But in my view the Bible’s references to “Trinity” have a ritual liturgical origin that does not lend itself to being considered as a gateway to onto-theology. In the rational theology of early Christianity the philosophical climate invited speculative analysis of the nature of God. The Trinity became an ontological category. Thus doxology gave birth to ontology and ontology provided and still provides criteria for orthodoxy. The realism Zuidervaart rejects in reason’s focus on order may unintentionally return in a realism of another kind, namely the ontic realism of the Trinity. For me all the more reason to ask whether a more radical critique of reason is not only called for but possible. Zuidervaart’s magnificent project of critically retrieving reformational thought makes no apologies for taking on the comprehensive scope of philosophy. So it may be appropriate to place this exchange in the wider context of his retrieval. These days in open and progressive Christian communities theological discussion tends to manifest a spirit of ecumenism. So participants tend to hold doctrines, teachings, confessions and other fiduciary properties in ways that allow them to recognize others as fellow travellers. To claim Jesus is Lord or to confess Jesus is son of God is not so much a barrier but more an invitation to travel together with people of faith whose confession differs. These are practices of faith in which reason plays a role. An ecumenical spirit, however, seems less likely in philosophy, perhaps as a more concentrated practice of reason and historically less inclined to accepting a plurality of approaches to the same problem. But when philosophy is comprehensive it shares with religion a more visionary scope that does not look for precise, exact, evidence based and verifiable results. Perhaps the time has come to adopt an ecumenical spirit in search for philosophical conversations tolerant of variants in philosophical truth. Zuidervaart himself provides an inspiring leadership in this respect, being at home in and conversant with philosophically exceptionally different and distant traditions. It is hard to envision Adorno and Quine as conversation partners, but Zuidervaart is in conversation with both and renders insights of the one to be fruitful for understanding the other. As philosophers we are prone, from within the optics of our own view, to consider a view that differs from ours as requiring correction, rather than as an alternate resource for discussing the advantages or disadvantages of gaining understanding in more than one way. In this discussion I have looked at validity as a needed corrective for understanding order as what reason is about. What if I had viewed the one as complementing the other? Perhaps the time has come to adopt an ecumenical spirit in search for philosophical conversations tolerant of variants in philosophical truth. I will always remember with gratitude my first reading, as a graduate student, of Karl Jaspers’s Groningen lectures of 1948, the year when the World Council of Churches was born in Amsterdam. His Philosophical Faith opened with comparing Galileo’s truth that could be recanted and still remain true and Luther’s truth that would be betrayed in being recanted. I read and re-read that little book as a source of insight and inspiration while continuing to be at home in reformational thought. Both offered different perspectives on truth, the one no less valid than the other. We are not likely ever to discover a philosophy that “gets it right” in the sense that we will now all become subscribers and bring our library to a garage sale. There are no definitive performances of a Beethoven symphony and philosophy also does not manifest itself in such perfection. But philosophy could be conceived as service to its community and could offer comprehensive insights to help a community integrate its shared intelligence. Such a philosophy could facilitate the rational formation of understandings toward practices that embody the love of God and neighbour in our time. Perhaps in such a practice of philosophy different practitioners might offer different views of some issue, though each contributing in a unique way to traveling the roads of love. Zuidervaart has already presented himself as a proponent of multiple modes of truth. Might his project of critical retrieval lend itself to supporting philosophical plurality as a fruitful strategy on the way? Hendrik Hart is Professor Emeritus in Systematic Philosophy at the Institute for Christian Studies, where he was a founding member. This year marks 50 years since he joined ICS. He is the author of numerous books and articles, most recently, with William Sweet, Responses to the Enlightenment: An Exchange on Foundations, Faith, and Community. I am wondering Henk whether this irenic ethos that you end your piece meditating on flows from a recognition of the mystery of existence as inexorable context for all our thinking. Life is so wondrously complex that our most expansive concepts are not big enough or sophisticated enough to envelop the realities they engage and point to. But as mysterious as existence is it is also shared. And that communio means that we can ask of a fellow thinker about her thought what in the universe that I talk about in my way is she referring to when she uses the concepts, words and sentences that she does. In other words, we can and should struggle to think alongside each other, even and especially when we say things to each other that are hard for us to receive given how we each talk and think about the world. I have reasons for speaking and thinking as I do. So do others whom I am minded to take issue with. The point is what to do with difference. Is it a mark of shame, of a failure that must be ascribed to the one thinker or another? Or is it an opportunity for mutual enrichment, even in and through stubborn disagreement. If I think of your long dialogue with Kai Nielson, Henk, I think of the ways your mutual respect and friendship grew out of your profound disagreement around the relationship of philosophical thought to "the religious" and religion. It was, as such, an instance of the latter scenario. What is odd is how often profound disagreement can function as a context for the growth of friendship and the love appropriate to it whereas disagreements that are far less profound rupture relations between thinkers who seem natural partners in thought to any third party. In short, I like your irenic take on philosophy in this piece. I agree its wisdom can point to Lambert's own philosophical practice for support. Of course, it all depends on how "Hegelian" the nature of Lambert's "use" of interlocutors is in thinking through problem "x" or "y". If their only role in his thinking is as set up for his own positive proposals (which I think unlikely) as opposed to positive sources for (particularly in and through the frisson of their conceptual juxtaposition) his own philosophical discoveries (which I think far more likely), then, the "ecumenicity" you are seeing would seem rather a mask. But since I think of Lambert's encounter with thinkers with whom he disagrees as generative and his posture one of authentic gratitude, the "ecumenicity" you see seems far more likely to be real, and your confirmation of the ethos it entails, well, worth the price of admission. Indeed it is an ethos I have spent my 24 years at ICS fostering in my own way with the Fathers and Mothers of the Church and their medieval successors as my interlocutors. And at bottom such an ethos suggests that difference not be arranged in the first instance in the form of an affirmation and its negation such that the one position must be true and the other false. Rather, one should assume that it is far more likely that there is a sense (yet to be discovered) that both positions serve to place us in the truth, for the world is a site of disclosure, aching to tell us secrets which in turn proffer, when received, blessings. Such has been my own puny experience all the years of my academic career. The thought itinerary you ask us to traverse in this piece is a wonderful case in point, prompting in me a hearty "amen". So may it be!